I have had many clients ask me how to “decorate” their office space to represent their company’s mission statement, but there is so much more to it than decorating! First you must ask WHAT can the physical elements of an office space say about your company’s philosophy? They can identify your firm’s values and principles. If the reception area is spruced up with the latest in modern furniture, but the employee workstations are dreary and worn, it can communicate to potential employees or clients what you consider important. On the other hand, if the reception area is accessible to the office space where clients can view the work in progress, it communicates a sense of transparency where honesty and openness are valued. They can indicate workflow and business processes. Collaborative teamwork requires an open and flexible environment where employees can gather and communicate freely. Benching workstations and standing height islands allow for a collaborative and open environment without having to sacrifice space or employee productivity. An office space with private offices lined up on the perimeter of the building communicates the need for more one-on-one interaction where privacy is important. To keep privacy in the center of the office, you might consider cubicles and partitions. These create a sense of privacy for employees while still feeling like a team. For example, a healthcare environment requires privacy, whereas a marketing firm values open concept and collaboration. They can provide inspiration. A thought-provoking environment can invigorate current employees, attract potential employees and galvanize new clients to think outside the box. Color, light, texture and form can all contribute to energizing a space so it doesn’t become mundane over the course of employment, but instead motivates and inspires. Artwork and sculptures are common elements that enrich a space, but these aren’t the only ways to brighten up an office; think outside the box! Underlying these three techniques is important in presenting your company’s AUTHENTICITY. While the tangible aspects of a firm’s space can project your business philosophies, your company must, of course, support them through its practices and policies. If your office is set up with collaborative workstations and focused on a team approach but the organizational chart still maintains a strict top-down workflow, there is no alignment here. If an office displays unique and creative artwork, but any new innovative ideas get shot down immediately, there is a disconnect between projection and process. You might be able to attract and hire the right candidate for employment, but you won’t be able to retain him. It is hard to discuss the physical aspects of a space without actual photos. This office is a web development and graphic design firm called Mindspike Design. As I walked into the informal reception area, I could see across the entire office including the gorgeous views of the Milwaukee skyline beyond. The ambience of this space contributed to a relaxed laid-back impression that stress doesn’t have to be a part of the daily grind! Several examples of their work were displayed casually throughout the space but not formally framed or strategically placed. No one here had a private office and several had low partitions with glass panels above to add a little more privacy. Here, the great views were not delegated to private offices along the perimeter but accessible for all to enjoy, even when you enter the front door. Natural daylight, which has been proven to increase employee productivity, fills the entire space. 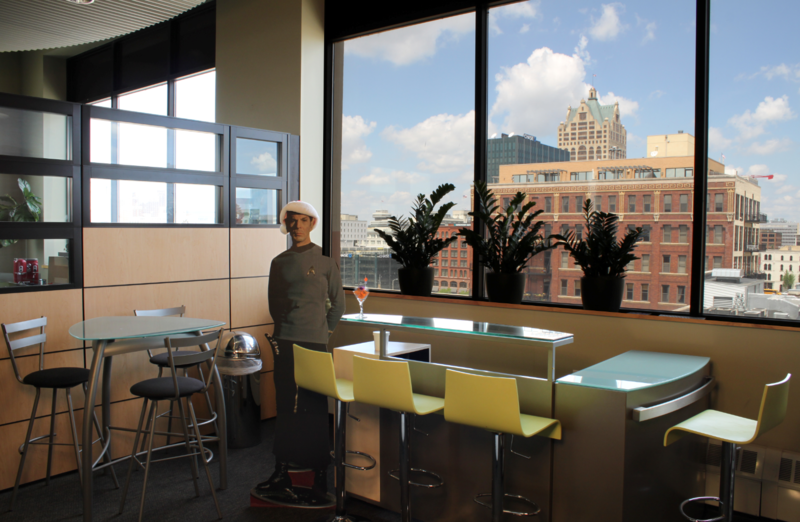 In this photo, Spock cozies up to a glass mini-bar, a great spot for employee breaks, casual meetings, or after-hours drinks. It is a collaborative workstation where inspiration can come from the outside, the inside, or the imagination. 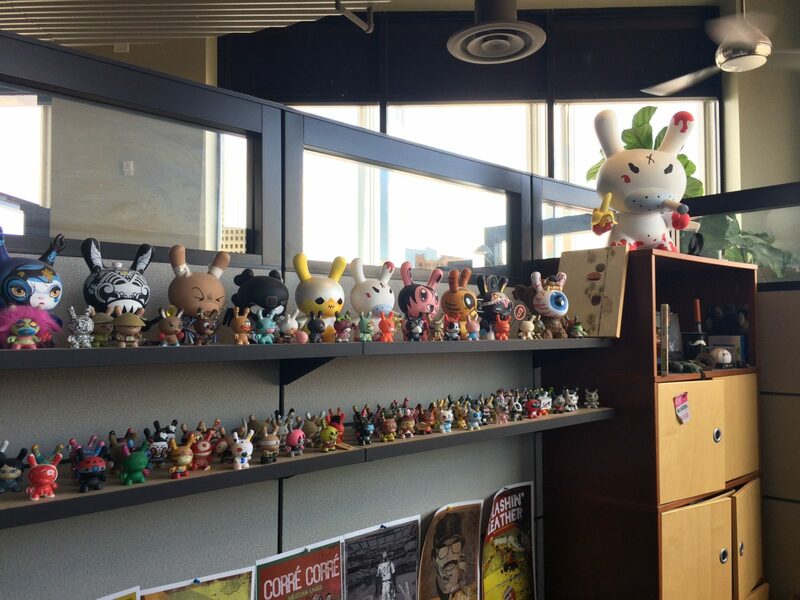 In this photo, a unique collection of Dunnys is displayed at a workstation that is clearly visible from the reception area. They are collectible pop art toys featuring designs by emerging and top artists. They project personality into this work space and an element of intrigue as to who meticulously dusts each one of these characters! Of course, this particular philosophy does not work for everyone. How is your company’s culture portrayed in your physical space? Or for a more enlightened approach, flip the question around to see what kind of culture your space currently projects. Ask an honest friend who has never been to your office to do a quick walk-through, then write down their impressions. You could also have your employees fill out a quick anonymous survey to get their insights or call in professionals at National Business Furniture to help. Go from there; you might be surprised!